Debt is a permanent feature of most of our lives. Yet the socialization of risk debt represents isolates individuals, locking us in the private misery of our dealings with banks and creditors. Medical debt, student debt, consumer debt, foreclosures -- these social forms mark so many personal failings and moral obligations, we are told. Debt, in other words, not only insures our continued servitude to the corporate pursuit of dwindling private profits. It also serves to alienate us from one another, and foreclose the possibility of collective resistance. Debtors’ Assemblies, then, are a first step in fighting back to reclaim our stolen futures. 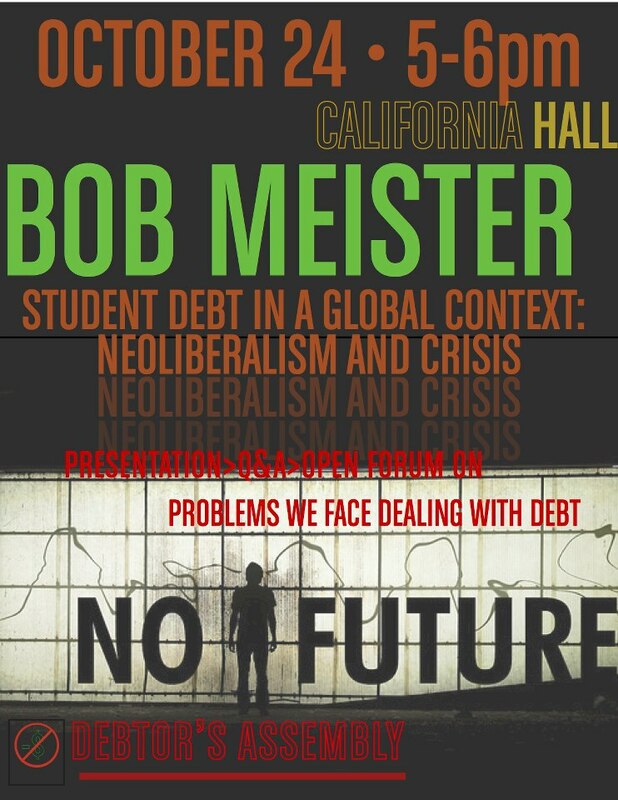 Please join us Wednesday, October 24th from 5-6 in front of California Hall for the first in a series of weekly Debtors’ Assemblies to learn more about the many forms of debt and discuss ways to resist debt’s claim upon our lives. 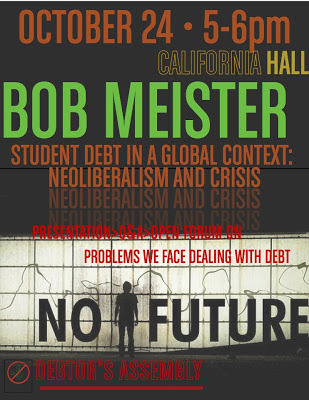 Robert Meister will speak briefly at the beginning of the first assembly. Sorry but debt can’t be a permanent feature of anyone’s life! You could have said ‘Pain’ instead! We poor human beings are destined to suffer eternal pain here in this hell called Earth. Yes, Hell is here and sometimes, you can even find Heaven here too. But I liked “It also serves to alienate us from one another”. However, I didn't get what Ryan has stated that you people perhaps pursuing a longer term project such as a debt strike or something similar. Now the question is what is ‘’debt strike”? I’ve been working as a financial writer since long but never came across this word! Does this really exist? If yes, excited to know what would be that.